I really live my Logitech Harmony 550. Even though the design has been replaced by newer models, I don’t intend on letting go of it any time soon. One testament to the design is how it balances in your hand around the d-pad. Here’s proof of how perfect the center of mass is. I noticed this after hitting my coffee table with a fresh coat of glass cleaner. What are some of the objects you use that impress you with details like this? I’ve got quite an overload of remote controls in my living room, so I’m always on the look out for a solution (and am so close to pulling the trigger on one). But… I think my prayers may have been answered with the Remote Wrangler! 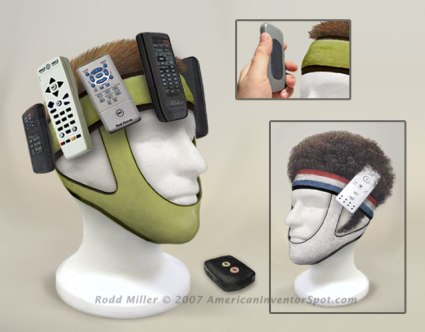 The Remote Wrangler lets you keep your existing collection of remotes, and utilizes storage space that we all have with us at all times… our heads!